I know there seems to be a holiday theme going where I wait ’til the absolute last minute to get ready. I swear it’s not always like this, but with a new baby and having moved eight times over the past five years, I seem to often be playing ‘catch up’ with something. But hey, life happens. I swear there’s always something …and perhaps you can relate. The good news is you can make up for it by being super prepared with a plan. I’m excited to share with you my favorite Christmas tree decorating tips just in case you waited as long as I did and are running out of time. Fret not, my friend: this guide is all you’re gonna need. 1. If You Haven’t Already, Find a Tree – I recommend selecting a tree that’s 6″-12″ shorter than your ceiling height to make the grandest impact and to still leave enough room for a tree topper. These days when Amazon 2-Day Shipping reigns, I really appreciate Wayfair’s quick shipping capability. A couple of my favorites are here and here. 2. Choose a Theme – This could be based on color, style, or an actual theme. This year, I went ‘Rustic Glam’ with an emphasis on ‘Glam’ and my color palette is white, bronze, silver, and brown. Search the web for inspiration and make note of what you love! 3. Take Note of How Many Lights and Ornaments You Will Need – Trust me, this works! By the time I was done decorating, I had the perfect amount of both. My go-to lights are here. 4. Ribbon – Stick with 2-4 types of ribbon for your tree. This year, I layered a 4″ gold glitter ribbon with a 2.5″ shimmery white ribbon layered on top. As far as how much you need, it really depends on what you plan to do with it: cascade, wrap around, or tucked and tufted. In this case, I recommend over-purchasing and returning the extra prior to the 25th. 5. Garland – Whether it be corded, tinsel, or grapevine, garland certainly adds a nice touch and an added dimension. The rule of thumb is 9 ft. of garland per foot of tree. Therefore, on a 7.5 ft. tree you’re looking at approximately 67.5 ft. or 22.5 yards. 6. Anchor Ornaments – These are extra-large decorations that add an artistic element. Some ideas are lanterns, bird houses, or any oversized ornament. Always use odd numbers here, just as you would any time you are accessorizing in your home. 7. Floral Picks – I love these for two reasons. One is that they can often be broken up into multiple pieces, and two is that the larger ones fill remaining holes quite nicely at the end. 8. 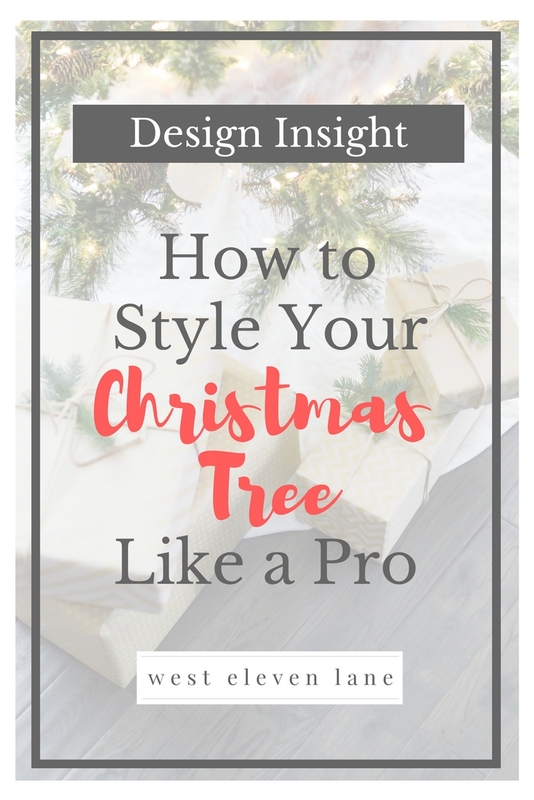 Tree Skirt – I use this term loosely as you really can use anything from a spare throw blanket you have lying around the house to an upside down galvanized bucket (with a hole drilled in it of course) to a basket. Tree collars are also really popular. My favorite one is here. String lights vertically instead of horizontally…Life. Changing. Quick to put up, quick to take down. Layer, layer, layer! My biggest mistake was always to under-decorate. The more, the better. This year I was able to snag a tree for $53 and it didn’t matter that I skimped on it because of my decorations. It has since almost tripled in price, which is why I am not linking it here. I hope my Christmas tree decorating tips were helpful! Comment below with your tree theme this year, and don’t forget to post your Christmas tree pics in my Facebook group as well! I can’t wait to see what you create. For more Christmas decor inspiration, check out my holiday board on Pinterest.